3M™. Permanent double-sided tape, good cohesion values. Good resistance to UV rays and temperatures up to 149°C for short periods. Excellent moisture stability. High dimensional stability and superior handling characteristics for lamination and punching." 3M™. Permanent double-sided tape, high initial tack. High dimensional stability and superior handling characteristics for lamination and punching. Good resistance to temperature and chemical agents. Suitable for both HSE and LSE surfaces. The sheet version (mm 700x1000 mm) is used in silk screen printing. 3M™. Permanent double-sided tape, high initial tack and excellent bonding. Suitable for both HSE and LSE surfaces. Excellent resistance to UV and plasticizer migration. 3M™. Permanent double-sided tape, high initial bonding. Excellent LSE surface performance. Excellent bonding on supports contaminated with oil such as mechanical parts. The PET support ensures dimensional stability on foam and other supports and simplifies cutting, punching and lamination. Permanent/removable double-sided tape can be removed without leaving any traces. Permanent adhesive side, removable adhesive side. Low odour emission. Solvent free. Permanent double-sided adhesive, specifically designed for plastic film splices. Permanent double-sided tape, highly adhesive and heavyweight. Suitable for bonding on flat and uneven surfaces, excellent of LSE plastic. High resistance to UV and excellent temperature range. Permanent double-sided tape, good dimensional stability. Particularly suited to lamination and punching. Good adhesion on a variety of surfaces. Permanent double-sided tape, very high initial tack and excellent cohesion. Suitable for application on LSE supports even at high temperatures. Permanent double-sided tape, excellent resistance to cutting and high temperatures. Good adhesion on LSE plastic. Permanent double-sided tape, ultra-clear, excellent resistance to tearing and high temperatures. Particularly suitable for punching and laser cutting thanks to protective plastic film. 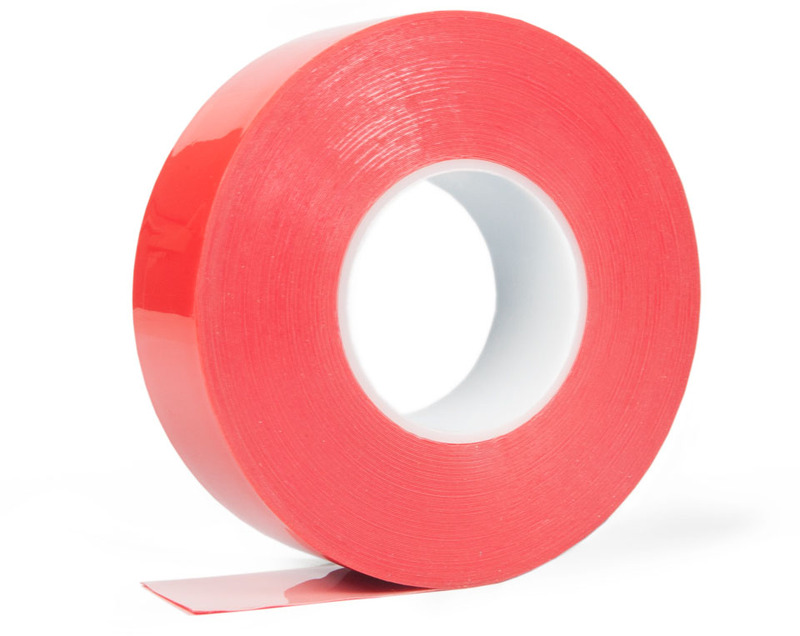 Permanent double-sided tape suitable for universal fixing, high initial tack. Good performance on supports with low surface energy. Permanent double-sided tape, specifically for the electronics and graphics market. The matt white substrate avoids the need for silk screen printing. Excellent dimensional stability, good resistance to UV rays and temperatures, suitable for LSE surfaces. Permanent double-sided tape, high initial tack, good cohesion even at high temperatures, also suitable for LSE surfaces; excellent UV resistance and dimensional stability. Particularly suitable for punching and laser cutting thanks to protective plastic film. Permanent double-sided tape, suitable for generic applications, where resistance to temperatures and ageing are not required.